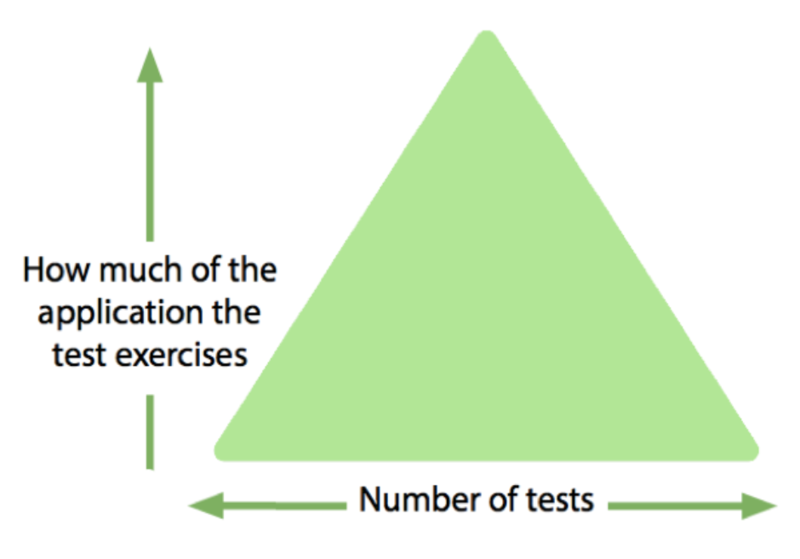 Learn how to formulate your automated tests with the help of the Test Automation Pyramid. If your team struggles with automated testing, don't feel alone or ashamed. I meet lots of people whose teams do all their regression testing manually. Other teams have automation but are finding it expensive to maintain and aren't sure if the tests are providing a benefit. 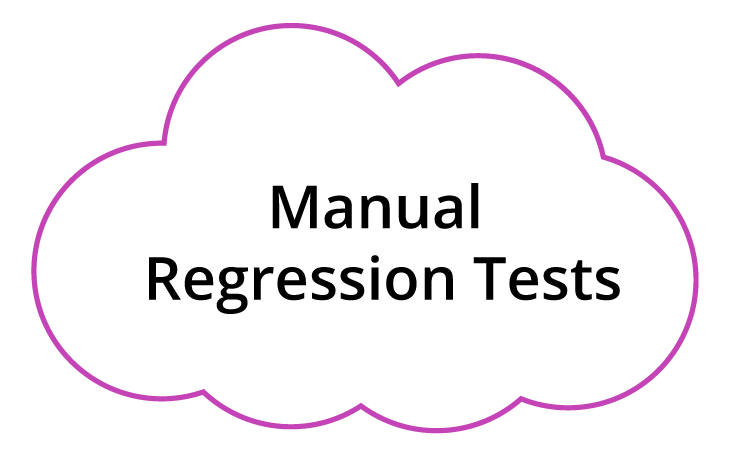 Teams who lack automated regression tests are incapable of delivering value to their customers frequently. Changing the code takes longer and longer, because there's more and more manual regression testing needed to feel confident about releasing. Get a diverse group of delivery team members together to talk about what's holding you back and whether automation testing might help with that roadblock. Think about the trade-offs between automating and doing testing manually. Both have a cost. Over the years, my teams have found Mike Cohn's "Test Automation Pyramid" a useful model to help us formulate our automation strategy. Yes, it is not actually a pyramid, it's a triangle, but what's important is that it helps you visualize the steps to take as you tackle automation testing. We also need to check functionality and other quality characteristics such as accessibility and security across larger pieces of the application with functional testing. For example, does an API endpoint return the correct values? These tests may take more time to create and, if they access databases and other services, provide slower feedback. If business stakeholders need to collaborate on acceptance tests to verify business rules, these middle layer tests can be written in plain language that everyone can understand. Products that have a user interface (UI) generally need to be tested across all these layers. The feedback loop from UI level tests is longer, but they can find the most important regression failures. Today's technology makes it easier to automate robust tests at the UI level, but many factors can still make these tests "flaky" and more costly to maintain. That's why the model has the fewest tests at the top level. 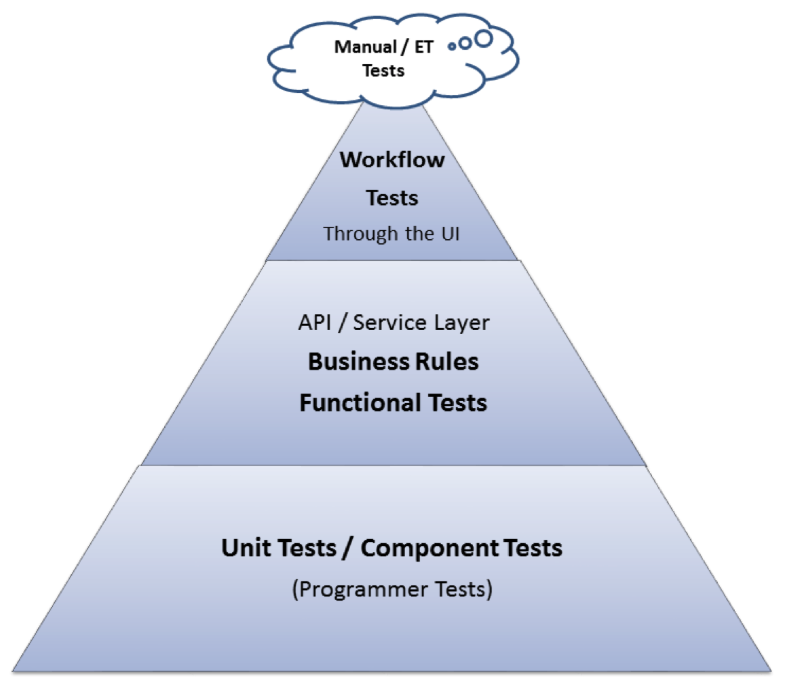 The little cloud at the top of the pyramid represents testing that's done manually. Even with solid automation at all layers of the triangle, your product might require a huge cumulonimbus cloud that includes exploratory testing, accessibility testing, security testing, and many other critical testing activities. You might be able to use automation to speed up this manual testing. There are many variations on the pyramid model, so take time to check those out and see if they work better for your team. Your context is unique, so experiment to find what helps you map out your first steps to automation testing success. I like the way that Seb Rose maps out the concept behind the pyramid. You want as many tests as possible that test smaller chunks of the application, but you still need to check the "big picture". In Chapter 15 of More Agile Testing, Sharon Robson explains a four-step process she uses to talk about automation testing. She starts with the basic pyramid, but adds on the tools that can be used to execute the tests, the types of tests or system attributes to be tested, and finally, the automated regression tests needed. If none of these models sings to your team, check out the links in the reference section at the end of this post. And if none of those help you get started formulating your strategy, grab some markers and a whiteboard (physical or virtual) and start drawing together to visualize what levels of your application need automation testing, and where you want to start. Your whole delivery team needs to agree on a starting strategy for automation. Automation testing can be scary and difficult, so you need to be willing to stick to it during the painful parts. We still had a lot of holes to fill, but since we didn't spend a day or two every sprint doing manual regression testing, we had time to tackle other automation challenges. 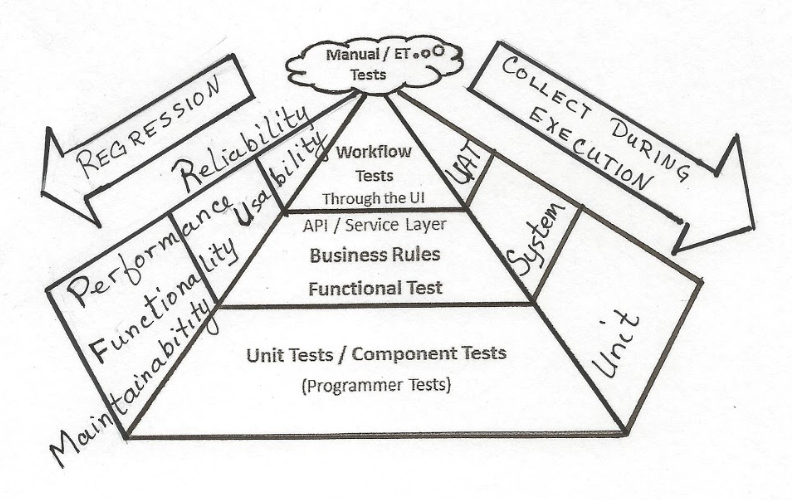 Eventually, our test automation triangle looked like the classic "pyramid" above. Successful automation testing requires a big investment over time. Start small. A good way to get started with automating unit tests is to write them for all bug fixes - or even better, test-drive them. You may decide to start automating API tests by doing them for all new stories or features going forward. 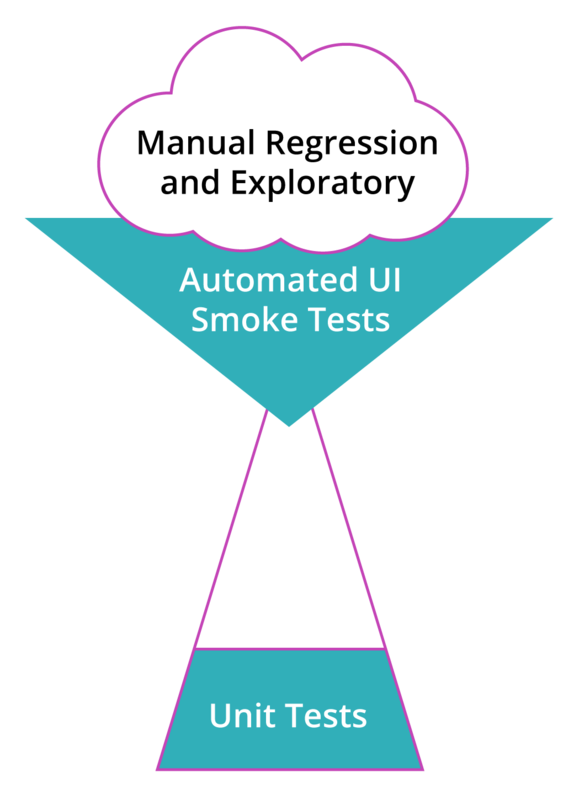 Or, if manual regression testing is sucking up all your time, take advantage of tools that let you quickly get up to speed on UI test automation and create some robust UI tests that cover the most critical areas, so you can devote more time to expanding your automation efforts to other levels. For sustainable automation testing that lets you release frequently and confidently, your team will need to invest time in learning good automation principles and patterns. What if your first experiment fails? Maybe you automate some tests and then find they are unreliable or impossible to maintain. Awesome - you have learned a lot, and that will help you going forward! Don't be afraid to scrap ineffective tests or a tool that isn't working for you and start over. Don't fall victim to the "sunk cost fallacy." As Seb Rose has said, "if a test doesn't help you learn something about the system, then delete it!"